The first Thor movie was a surprise. Like many of Marvel’s first efforts it had pacing issues and some difficulty achieving the level of spectacle befitting its brand but it was impeccably cast, entertaining as the day is long, and laid much-needed tracks for the machine to roll forward on. Chris Hemsworth was a revelation, Tom Hiddleston was nothing less than miraculous, and Idris Elba did tremendous work with very little. It also was extremely vital in providing the sensational The Avengers plenty of material to mine for its epic conflict. It had flaws for sure but the makers of the sequel certainly were paying attention so as not to repeat them. Thor: The Dark World is funnier, bigger, and more whole than the original. That’s mostly a good thing, though the central conflict still leaves something to be desired. Another disposable race of bad guys and another all powerful mystical weapon lie at the center of the film and it’s hard to get too interested in Christopher Eccelston and his Dark Elves. Luckily Tom Hiddelston’s Loki is back and though he spends much of the film imprisoned, his relationship and struggle with being Thor’s half-brother is by far the best thing about the series to date. In ancient times before Odin (Anthony Hopkins) took control of Asgard there was a battle between Asgardians and Dark Elves and when the weapon known as the Aether was locked away it seemed the threat was extinguished. As is always the case with such things, the weapon is released and it finds a convenient and unlikely home in the body of Natalie Portman’s scientist character. The race of villainous beings returns from exile and all reality is threatened. War erupts and its up to Thor and his unlikely ally Loki to save the day. Though the premise is familiar director Alan Taylor (of Game of Thrones and The Sopranos fame) delivers on the spectacle and pays keen attention to the design work while letting his performers do their thing. Chris Hemsworth is fantastic as Thor, embodying both the physical attributes of the character and the personality needed to make the invincible character fun. He’s never really at risk which is commonly a problem in films about Superman, The Hulk, or Thor but with his performance it doesn’t factor. Tom Hiddleston somehow manages to execute perfect comedic timing regardless of the dialogue and is truly the hinge that forever will keep this franchise afloat. All of the Asgardian characters from the first return and do their jobs admirably though the Mother/Father/Son plotline does wear thin. In a beefed up role Kat Dennings provides comic relief while newcomer Chris O’Dowd is a welcome addition. 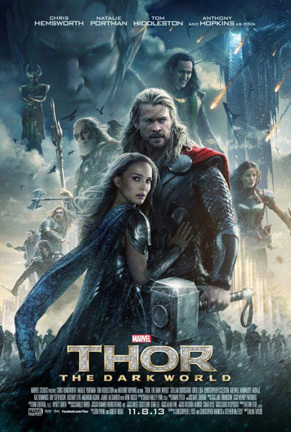 The love story between Thor and his Earthling dame still lacks resonance but it does take some of the edge off. The film takes some time to get its footing but luckily the last act is the strongest, obliterating a flaw common in many of the Marvel movies. The effects are superb and there are some interesting uses of the tech and weaponry that allows the film to not feel too bland in the wake of so many gigantic event movies over the past years. There’s nothing truly singular about the movie but as a cog in the Marvel machine it does the important things very well. It keeps the universe growing, features a few great nods to the other Marvel films I won’t spoil here, and further takes a difficult brand well into mainstream waters. It’s entertaining, truly funny, and with a few really effective moments in its climax. It’s very hard not to find a better piece of entertainment in this movie season and though the first ‘stinger’ is awkward and doesn’t lucidly set the stage for the Guardians of the Galaxy film, the bit after the credits killed. I took my soon to be ten year old daughter with me to the screening and she had the time of her life. The strongest and most rewarding value this new wave of Marvel movies have is their ability to deliver very solid entertainment that bonds parents and children without insulting their intelligence. Thor: The Dark World is a very polished piece of work that continues a line of excellence that feels no shame in delivering grand-scale fun to everyone who still loves movies for the escapism it provides. See it with your kids. See it with your friends. See it with your parents. There are few surer bets at the multiplex.